Holoball Review (PSVR) | Nerd Much? Holoball, for my money, just might be the PSVR’s first “killer app.” Sure, I loved Arkham: VR but I haven’t touched it since the day I brought my shiny new headset home. And yes, I really enjoy Sports Bar VR and think what it is doing in the VR space is really important (see my article on social VR gaming). 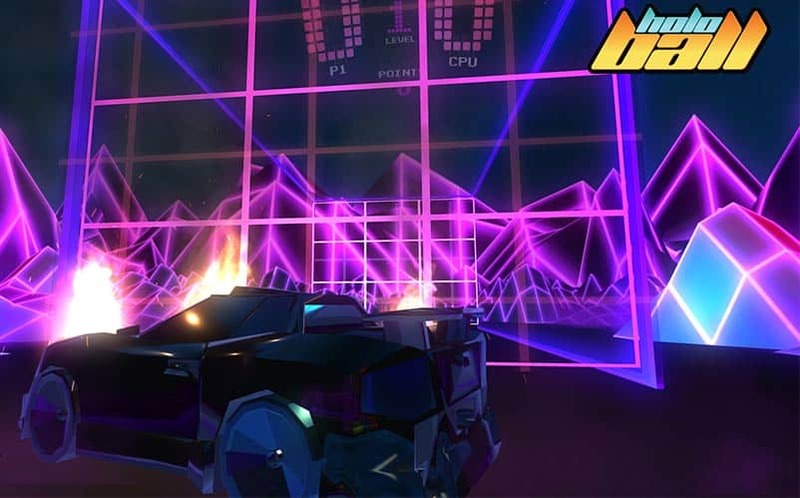 But there’s something about Holoball that is just so damn fun (the 1980s vaporwave aesthetic is pretty cool too). On top of all that, Holoball is also probably the most exercise you can get playing a video game — Pokémon GO and VR games that use that $400 stationary bike peripheral notwithstanding. What is Holoball, you ask? 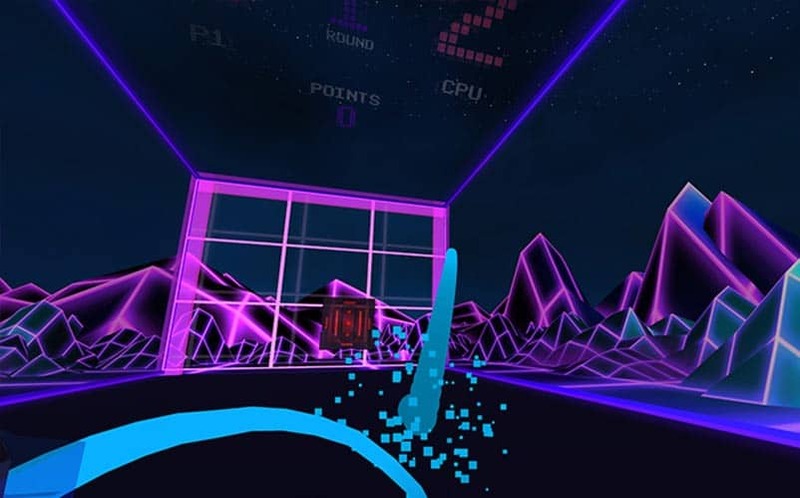 It’s really quite simple: virtual reality racquetball in a Tron-esque world. And like most simple games, it is really addicting. Like most of the PSVR games that are currently out, it really is better to just experience it for yourself. Trying to explain this game is like trying to explain Pong; you just have to feel it. I can tell you that it feels really great. The physics seem spot-on. Unlike Wii Sports: Tennis where you more or less let the ball hit your racquet, in Holoball you can actually hit the ball and put some English on it. It’s not perfect (which is related more to the PSVR’s limitations than the game), but you can return shots with a topspin, backhand, drop shot, etc. One ingenious feature that makes the gameplay a little different than what a simulation VR tennis/racquetball would likely be like is the “tractor beam.” When you hit the ball it turns blue – that is how you know the ball is under your command. Then, anytime while the ball is blue, you can press the T button (the trigger on the PS Move controller) to engage a “tractor beam” that pulls the ball back towards you. This is great for two reasons: 1) you can set up some really awesome trick shots and psychological maneuvers by letting the ball get close to your opponent, sucking it back to you, then hitting really hit at a different angle and 2) from a mechanics standpoint, the “tractor beam” allows you stop otherwise dead balls (where the angle or lack of power causes the ball to lose momentum before reaching your opponent) or mistakes where you might score on your own goal. I love this feature and can’t imagine Holoball without it. So the gameplay is really tight, fun, and addicting but there is more to a game than its gameplay. Luckily, the visuals and music don’t disappoint. The synthwave music by Dance with the Dead perfectly meshes with the overall aesthetic. The sound effects are great and the A.I. you play against constantly quips at you, insulting the player in the same vein as Portal’s GLaDOS. And I already discussed the Tron-inspired vaporwave graphics, which I love. There’s not too much more to discuss in this realm, and, quite frankly, it’s not incredibly important for this type of game. One thing I will add is that there is always a high score leaderboard present whenever you’re playing the game — this is key for a competitive arcade-style game like this. I kept playing and playing, wanting to get on top of the leaderboard. Also, to add to the 80s aesthetic there’s also an arcade game-style font and even a name entering mechanic when you reach a high enough score. Holoball could easily just take your PSN username and put it into a leaderboard, but it instead it harkens back to old-school gaming and allows you to input your own name — or the name “a55hole” as so many of us were inclined to do back in the day. It’s the little things like this that make Holoball the complete package. Lastly, I want to discuss the game modes. When you initially boot up the game you are dropped into this futuristic looking cube and told that you, like all human prisoners, are being given the chance to play a game “for your freedom.” This little bit of narrative isn’t really relevant or important at all, but again, it’s one of those little things that when combined with everything else adds up to create a great game. Your choices to “win your freedom” are arcade and campaign. If you choose the campaign, you will see there are four difficulties with only the easy option unlocked. Choosing easy brings you into the game where you must win five rounds of five points each against the A.I. opponent. After each round the A.I. gets more difficult and either the shot power or ball speed increases. 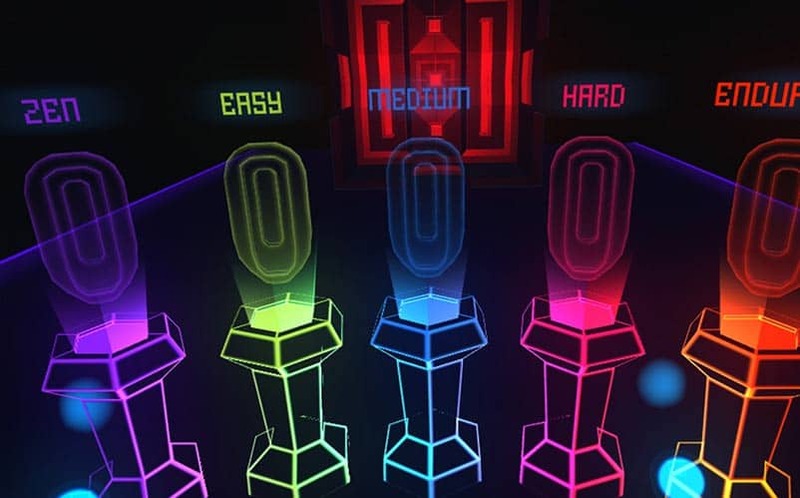 Easy mode is, like the name implies, quite easy — even on the fifth round. Then things get a little more interesting in medium. It is the same five/five set-up, but this time the “room” and A.I. paddle expands, giving the A.I. a bigger goal to score but making things more difficult for you. Again, the difficulty ratchets up as you play and by round three of medium I actually found myself losing and having to start over. After some practice, I eventually finished and moved on to hard, which was a real challenge. So, after this, the campaign is more or less the same, but it is a lot of fun and never feels repetitive, just like most sports games. The arcade option consists of three modes: zen, score attack, and endurance. Zen is a mode where instead of playing against an A.I. opponent you hit the ball continuously against a wall for practice. This is another ingenious addition that I love. It may sound boring, but anybody who has ever had a folding ping-pong table or has played solo tennis/racquetball against a wall knows how fun and relaxing this can be. Score attack is similar to campaign except it is not played in stages and you instead try to get the highest score after factoring time, points allowed, and other elements. Then there’s endurance, my personal favorite for competitive play. You have three lives and lose one every time the A.I. scores. Your goal is to score as goals as possible before losing all three lives; there’s no thousand point scores that factor in time, just simple double-digit numbers. My best so far (though, admittedly, I haven’t played very long yet) is 10… and the highest, as of yesterday, was 42. I could absolutely see Holoball Endurance being a fun party game for a small group of people. There are a few things I must address before concluding this review. First, after only playing Holoball for five minutes I immediately thought “this will be amazing with multiplayer.” Multiplayer is, as a concept, a no-brainer, but I’m sure it’s very difficult to make work — especially with a game that would absolutely need perfect latency and no lag whatsoever. There is good news, though! The creator, Shawn Blais, said in an e-mail that they were hoping to add multiplayer support to the PSVR version in Jan-Feb of 2017. So, luckily, we won’t have to wait too long. I said at the beginning of the article that Holoball “just might be” the PSVR’s first must-buy title; well, once it has multiplayer that will absolutely be true. Competing for a high score will suffice for now, but this game will reach another level once we can play against real people in real-time. The last thing I want to say is a bit of a warning or disclaimer. Because of the nature of this game, you will need quite a bit of room. You will also need to move anything that could be damaged out of your play area and you must wear the Move controller straps. Now listen: I was the guy who always ignored the Wii’s “strap warnings,” but Holoball is different and you most definitely will throw your Move controller through a window if you don’t wear that damn strap. This is a very active game! Also, because of this, the more room you have the, more fun Holoball will be. In fact, I’m considering rearranging my living room furniture and changing my Playstation Camera set-up just for this game. At $14.99, Holoball is a must-buy for me, even if the multiplayer isn’t here yet. I would pay double that, maybe more, if it had the online multiplayer. Holoball is a game that is just too fun and addicting. The silly yet charming premise, excellent music by Dance with the Dead, and really cool vaporwave aesthetic add up to one great package. If you have a PSVR and like tennis/ping-pong/racquetball even a little, then you have to buy this game. Holoball releases for the PS4 (and will be Pro compatible) on November 22 and is already available for the HTC Vive.